Your car is made of a long list of components all working in perfect order. Unfortunately, even if one of them breaks down, or starts malfunctioning, it affects the entire system and makes your vehicle unfit to drive. For example, let’s talk about wheel alignment. It is the angle of your car wheels with respect to its body. While it might sound insignificant, it affects your cars handling characteristics, tyre wear, and most importantly, your on-road safety. While professional racers often change their cars’ wheel alignment to meet a particular need, your car wheels should be perfectly aligned for day to day use. Even the slightest misalignment can result in a severe accident. That’s why experts always recommend repairing this issue whenever you detect it. Thus, in case of a problem, you should bring it to us, Easington Service Station, and get it repaired in our 4 wheel alignment garage in Easington. Fortunately, misaligned wheels are easy to detect. The first sign of trouble will be your car veering off to one side whenever you are driving it. This unwanted pull can be very dangerous; it can easily bring you in front of oncoming traffic. Another sign is excessive tyre wear. Generally, misalignment causes tyre feathering, excessive wear in only one side of the carcass. This uneven wear will render your tyres useless, and you will have to go for an expensive replacement much sooner. You will also hear a lot of noise when you drive. The misalignment drags the tyres against the road (which causes feathering). Tyre noise will significantly increase because of that condition. Also, as the axles are connected to the steering wheel, it will also be crooked in one direction. You will have to put extra effort to get your car moving in the proper direction. The moment you notice any of these issues are plaguing your vehicle, bring it straight to Easington Service Station. We have a team of expert mechanics armed with cutting-edge tools to measure, detect, and repair even the smallest misalignment. We offer toe, caster, and camber alignment in our 4 wheel alignment garage in Easington. Let’s discuss what we do in each of the processes. 1. Toe alignment – Probably the common most wheel alignment issue, ‘toe’ is the angle of deviation measured from a straight line. Toe misalignment can happen in both front and back wheels, and there is two main type of toe alignment that we cater to. Toe-in – Toe-in generally happens with the front two wheels. If they are pointed inwards, toward the centre line of the vehicle, that condition is called a toe-in alignment issue. Toe-out – This is the exact opposite of toe-in. In this case, the wheels are pointed outwards, making a ‘Y’ shape in respect to the axis of the vehicle. Toe alignment is one of our most sought-after services. We refer to it as ‘toe-and-go’ service because of its nature. 2. 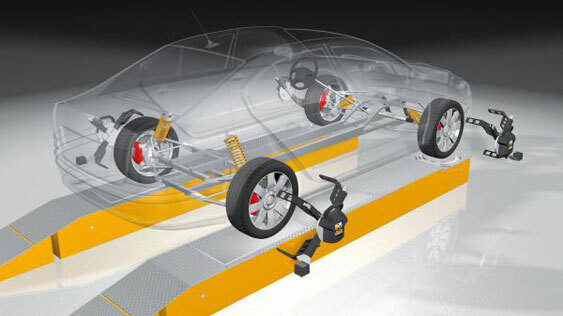 Caster alignment – Your car’s steering pivot angle also gets affected if its wheels get misaligned. Our wheel alignment in Easington services tackles this issue with our caster alignment services. Caster displacement creates two different scenarios. Positive caster – If the steering angle decreases the contact point of the tyres and moves it further back towards the rear axles, it is called a positive caster angle. Trailing caster – This is the exact opposite of positive caster. In this scenario, the tyres are behind the contact point, ‘trailing’ the point of contact. Caster misalignment can cause dangerous oscillation in the steering wheels; effectively decreasing your car’s handling characteristics. 3. Camber misalignment – Another issue that some of our customers face is a problem with the camber. Camber is the vertical tilt of the car wheels. Ideally, car wheels should have zero camber, meaning all 4 of them should touch the ground vertically. It keeps an even contact with the road. Camber issues come in 2 forms, positive, and negative camber. Positive camber – If the top part of your car tyre sticks out, it is called positive camber. In this scenario, the outside sidewall of the tyres is in contact with the road and wears out faster. Negative camber – In this scenario, the top part of the wheels stay point inside into the wheel-arches. This affects the inside portion of the tyres. Our 4 wheel alignment garage in Easington has all the necessary equipment to fix it in no time. Being one of the largest 4 wheel alignment garages in Easington, Saltburn-By-The-Sea, and Cleveland, we cater to many car owners who are facing difficulties with their vehicles. Not only wheel alignment issues, but we also perform all other types of repairs and sell manufacturer specified spares. Book your appointment today. We are available Monday through Friday, from 8:30 AM till 5 PM. On Saturdays we stay open from 8:30 AM to 12 PM.